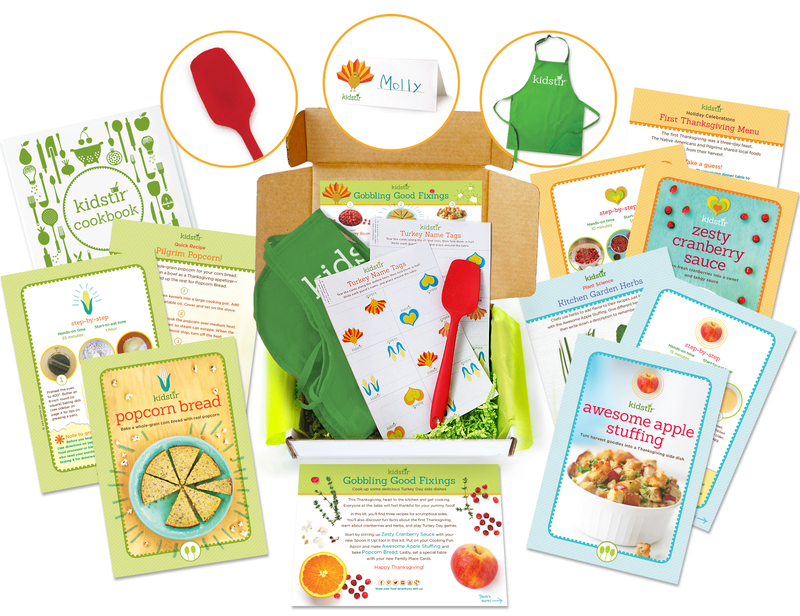 I’m so excited to introduce our November Gobbling Good Fixings Kit! Thanksgiving is my favorite holiday of the year, full of themes that I strive to reinforce for my kids all year long: family time, gratitude, and expressing love through good food and cooking. Plus, I admit that I love that every little Kidstir chef will get their own apron inside this month’s kit. The thought of all those special family meals being cooked by little chefs in their happy green Kidstir aprons just has me beaming. Family, food, love = perfect life. As you know, Thanksgiving is a holiday best planned ahead, so start off by reading our post about creating a great Turkey Day with Kids. That’ll get you in the right frame of mind to dive into the kit. Zesty Cranberry Sauce Getting kids to make this important but not overwhelming part of the big meal is a terrific way to get kids involved in the Thanksgiving prep process. And who doesn’t think this is indeed one of the yummiest parts of the whole meal! A little sweet, a little tart, it’s got the perfect mix of flavors…mmmm! In the same vein, here’s another simple and easy way to involve even the littlest kiddos: our Turkey Time vegetable crudite. Insta-adorable! Popcorn Bread Yes most people include cornbread in their big meal, but by incorporating freshly popped real popcorn, we’ve put an unforgettable twist on the classic. Kids will learn how those little kernels become a favorite snack (go ahead, pop a few into your mouth!) and then get to transform their popcorn into a moist, flavorful, and hearty cornbread side. While the popcorn is popping, teach the little ones How to Set the Table! How’s that for multi-tasking! Awesome Apple Stuffing Here is a recipe that we think adds a fun fall flair to a tried and true accompaniment. The ingredients list is mostly full staples that you have or would be picking up anyways, like broth, eggs, butter, etc. Nonetheless, the addition of the apples will impress your guests and give your little chefs some serious holiday cooking cred! Once you’ve got this stuffing done and are ready to add another side to the table, give a try to our fun and easy Yam Slam recipe online. Also a sure fire hit! I know I’ve already given away that this month’s kit includes an APRON for every kid, but every one of this month’s tools and extras is sure to delight! Spoon it Up! Tool This one is a keeper. We often hear from families who use this perfectly sized red silicone stirring spoon all year long. It never gets too hot to hold, doesn’t melt if left leaning on the pot, and doesn’t scrape up non stick bottoms. Yes, yes, and yes! Family Place Cards When you’ve got a crowd, deciding who’s sitting where is an important job. So how about you let the kids figure it out? They can fill out the cute place cards included in your kit (here are some printable extras if you have an even bigger guest list), then set them up around the table so everyone know’s whose sitting where. And while they’re at it, have them cut out these Thanksgiving Conversation Starters into a basket too. You’ll be set for a lively meal. Cooking Fun Apron Wowza! Can you believe every one of our little chefs is getting their own Kidstir apron with their November kit?!?! These bright and fun (and easy to wear and wash) aprons will get kids super excited to jump in the kitchen, whatever the occasion might be. My kids love to throw their aprons on to get into the baking and cooking spirit. Speaking of baking, you MUST check out or cute Tiny Pies. Filled with apples or berries, they’re such a sweet way to complement the pumpkin pie mainstay. So far we’ve just discussed the recipes and tools in the kit –don’t forget all the great foodie learning tucked into the kit: How to Roast Garlic, a Plant Science primer on Kitchen Garden Herbs, a Gratitude Game, How to Zest an Orange, First Thanksgiving Learning, Fun Facts about Cranberries, a Quick Pilgrim Popcorn Recipe, and a Food History Amazing Maze Puzzle. Mmmm…And then there are all the additional recipes and activities you can find on our DIY page. I hope this gets you in the mood for a memorable family celebration this Thanksgiving. 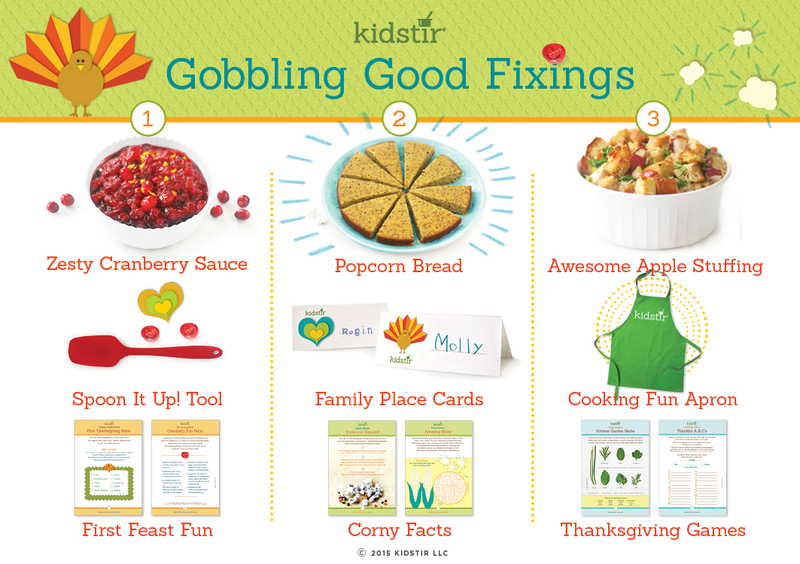 Tear open your Gobbling Good Fixings kit and start cooking! We are so thankful to all of you for cooking with Kidstir. We hope that our kid friendly cooking kits and ideas help your family make memories in the kitchen at this time of the year and all year along. On that note, here’s one last idea that may be the most important of all. This year, play this simple Gratitude Game at the table. It’s a simple way for kids and grown-ups to take a step back, soak up the moment, and revel in all that we have right here, right now. Happy Thanksgiving!